I’ve spent the past week prepping to facilitate an upcoming workshop about grading for high school teachers. I thought I’d share some of the information I found, as it seems to me a valuable conversation for administrators to explore at a faculty meeting, coaches to examine with teachers, facilitators to discuss with PLCs, and mentors to investigate with beginning teachers. How to use formative assessments for progress monitoring that is not part of grading? Are grades raised or lowered by behavior? Attendance? What consistency exists within a school regarding what a grade represents? Do extended learning opportunities enrich student learning or raise grades for working more? What is learning and how do we “record” that to a grade? Can I require assignments that aren’t graded? Grades should reflect achievement of intended learning outcomes. The primary audience for messages conveyed in grades are students and parents. Grades should reflect a particular student’s individual academic achievement only. Grading policies should be set up to support student motivation to learn. Grades should be based on a student’s standing among classmates. When students receive “poor grades” for their performance, they are motivated to do better next time. A grade should reflect the student’s achievement, work habits on responsibilities like homework, class participation, and behavior. 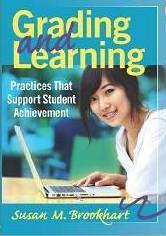 Learning skills information – Information from observing student behaviors that promote learning (like effort and work habits). Grading Information – Information from summative classroom assessments used to communicate achievement of intended learning goals against standards. Here are the questions I’m planning to ask the teachers to explore. What key learning standards have been mastered by anyone receiving a grade of C? B? A? What assessments will be graded and how will they be weighted to measure learning standards mastery? How will test be used to measure learning standards met? What additional items or criteria will be included in a grade? How will you present your plan for grading to your student? In what ways do you see your plan for grading motivating students? My power point with this information is available to you. If you use any of what I presented, I’d love to hear your experiences.